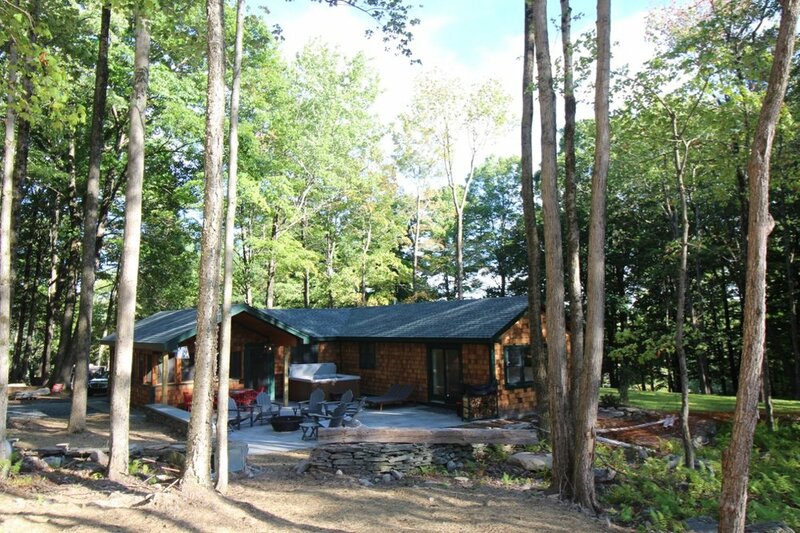 Reasons to Rent: Huge porch, alluring fire pit and hot tub, tucked in the woods. Crosslands has been designed for maximizing enjoyment of your leisure time. Whether it's first thing in the morning, when you can fix your coffee quickly, with the Keurig, or brew it in a French press, you can opt to start the day on the bright, open side porch listening to the birdsong, or gather round the teak dining table in the 380 square foot screened / glassed porch with a background of tunes from your playlist on the housewide Sonos audio system. You might choose to hike the extensive woodland behind the house, or grab a brick oven pizza or local produce in a nearby town. Alternatively, you may prefer to chill and login to Netflix or watch the big game on any of the four smart TVs throughout the house. The sectional seating area in the porch is pretty much guaranteed to be the favored spot during your stay. The screens make it the go-to spot in summer, but when temps drop the screens are swapped for glass, meaning you'll be able to enjoy the 3 season porch throughout the fall & spring. Though the kitchen is incredibly well-appointed, with gas stove, ample counter space, and an abundance of high quality utensils and cookware, the gas grill will likely beckon, and the large bluestone patio will be the new center of the universe. Some will relax on the lounges while others will soak in the hot tub. And when the feast is ready, guests can dine al fresco, or in the porch, or at the dining table in the house. But one of the most quintessential Catskills activities is spending quality time around the fire pit, under the stars. Surrounded by six Adirondack chairs, this fire pit is built into the patio and will foster lively conversation well into the night. 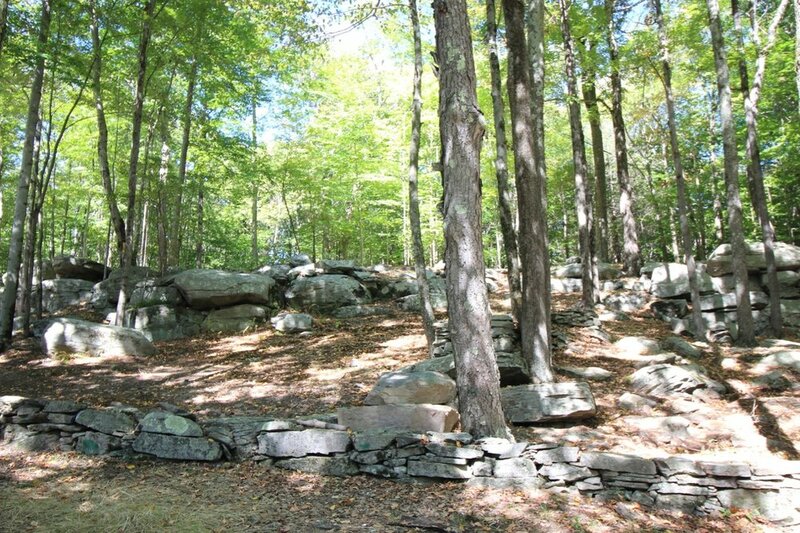 If you prefer your fires in more rustic settings, a second, large rock-ringed pit can be found above the dramatic rock outcroppings in the woods. Spend warm summer days taking a dip in the one acre swimming pond. In the winter months, hunker down in front of the gas fireplace in the living room and watch the snow fall. There are two bedrooms at Crosslands, a guest (full) and spacious master (king), which opens onto the patio. 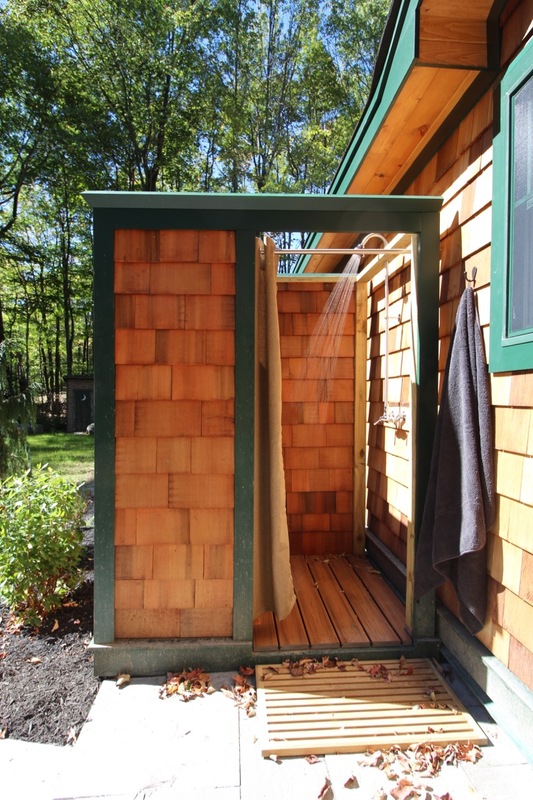 The tiled bathroom has a walk-in shower, and there is an outdoor shower near the side porch.